Moises Solana had a Formula One career that spanned six seasons, but he only accumulated eight grand prix starts as he remained in Mexico to pursue other more lucrative sporting careers. A talented jai-alai player, Solana made his money through the squash-like sport and used it to fund his motor racing career, enjoying considerable success on the domestic scene. He made his debut for BRM in the inaugural Mexican Grand Prix of 1963, and in doing so became the only driver ever to race a car bearing the number 13 in a grand prix. He appeared in every Mexican GP from 1963 until 1968, along with two races in the United States, and attracted the attention of Ferrari who offered him a Formula Two drive. With other possibilities available to him in Mexico he would only move to Europe for a full-time Formula One seat and so declined the offer. 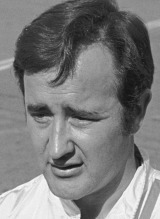 He was often let down by his machinery during his appearances in home grands prix, and he was yet to score a world championship point when he was killed in a crash in the Avandaro hillclimb in 1969.